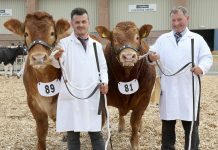 The Siddal herd owned by Paul & Alan Fletcher, of Birch, Heywood, near Rochdale, has been recognised by EBLEX as the Most Improved Herd of Limousin cattle in England for 2013. 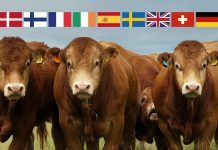 The award is presented by the EBLEX Beef Better Returns Programme (BRP) to the recorded herd that shows the greatest genetic gain for commercial characteristics over a 12-month period. There is a separate award for each of 10 UK breeds. 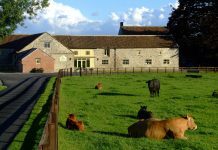 Siddal Fold Farm has been owned by the Fletcher family for 80 years, and is farmed by brothers Paul and Alan Fletcher. In 1999, Paul expanded the enterprise by renting the neighbouring farm, Top O’Th Hill. Alongside their other jobs (Alan is a contractor, while Paul runs a milk round) the brothers run a pedigree herd of 50 Limousin cattle plus followers, a 40 head commercial herd, mostly made up of Limousins, and a 100 ewe commercial flock. Paul’s interest in cattle began 35 years ago while he was still at school and bought a half-bred cow. Three years later, having got impatient with the time taken to breed it pure, he bought his first pedigree cow, a French import called Haskala, from the Marden herd in Herefordshire. Although she was already 10 years old when he bought her, 90 per cent of the herd go back to Haskala. While simultaneously buying in stores to finish, Paul gradually built up his own herd, selling off groups periodically when the time suited. 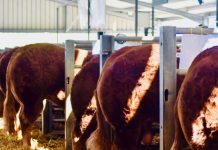 The Siddal herd is now part of a High Herd Health scheme and building up their numbers by keeping their own replacements and finishing homebred stock. Paul has always been a fan of the Limousin breed. “They’re easy calving and fast growing, which is what makes the money at the end of the day!” he said. The Siddal herd calves in Spring, with the aim to have cows calving indoors from mid-February until the end of April. Heifers are calved slightly ahead of the main herd in January and February, at the same time as lambing. While housed, the herd are fed on minerals and silage, and this is supplemented after calving with a little corn until turnout. Calves are weaned at around 10 months old and generally stay indoors from that point. Paul has been performance recording for over 10 years. He always submits weights and most years he also uses ultrasound scanning. He sees recording as way to confirm what the eye can see and believes that 90 per cent of the time it proves what you already think about an animal. “Performance recording gives comfort and confidence for the next breeder buying that animal or progeny from it,” he said. All heifers within the Siddal herd are kept and served, with some being sold with calves at foot. Heifers currently calve at three years old, although Paul is debating whether to put them to the bull earlier, at around two years of age. 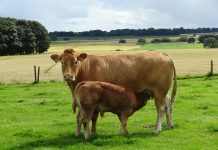 All bull calves are currently kept entire and around 10 per cent of them are sold for breeding, while the remainder are finished at between 12 and 14 months. 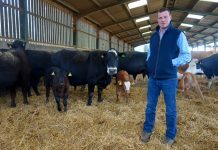 Paul always uses EBVs and his policy is to ‘mix and match’ with a range of high EBV sires, as he is always striving to breed a better cow with good maternal traits. 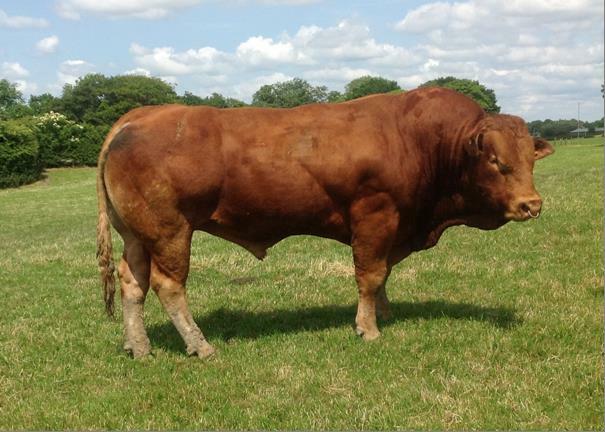 Currently he has a bull called Beck Collier, which he uses on heifers and commercial cattle. 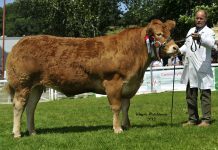 Last year, he used a homebred bull, Siddal Drew, who consistently produced calves with beef values in the top 10 per cent of the breed. Beck Collier has strong maternal traits (milking and ease of calving), making him a good match for Drew’s daughters. Since being informed at an EBLEX meeting that the loin is more valuable than the rump, Paul has also been actively selecting for length, together with a good rear end. 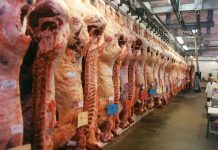 Identifying animals with superior carcase trait EBVs greatly assist this selection process. Cattle from the herd are mostly sold off the farm to commercial suckler producers in the local area, although he does take a few bulls to Skipton in order to showcase his work. Due to the longevity of the breed, he often finds that he doesn’t see a breeder for five years, but he generally finds they come back to him when the times comes to buy a new bull. “Hopefully the award will prove to people that what I’m doing is working. 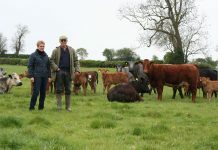 Jackie and Mirvin Lumb of Peat Pit Farm, near Halifax, run a suckler herd of 45 Simmental and Limousin Crosses with two stock bulls. They met Paul years ago selling Limousins at local market and have been impressed by the tremendous improvements in the herd since then. Jackie and Mirvin used to hire bulls in, but when they made the decision to source their own bulls, they went straight to Paul. 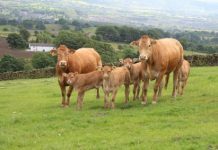 Following on from the success of the first bull, Major, they have had a string of eight Siddal bulls, including their current stock bulls which are producing some fantastic calves. They have also purchased a number of heifers from Paul, which they’ve found to be easy calvers, producing calves that grow very well. “Paul is a well-known and trusted breeder; he knows his stuff and is passionate about his Limousins and their individual breeding,” Jackie said.